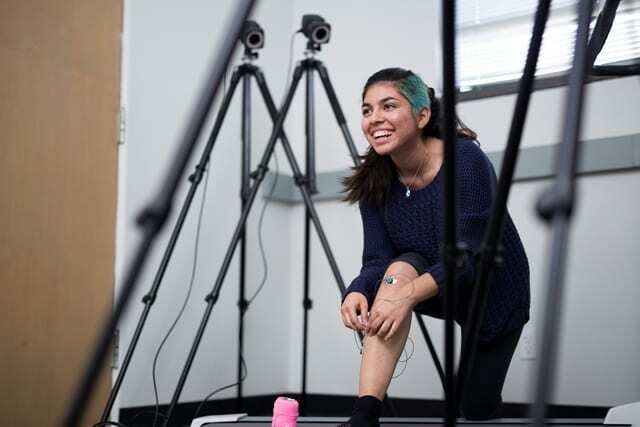 In the Intelligent and Em bedded Networks and Systems Laboratory at Loyola Marymount University, Gustavo Vejarano, Ph.D., studies how wireless sensors can be used in physical therapy to capture a patient’s range of motion and help assess rehabilitation progress. But a recent project was stymied until he asked a colleague, and expert in human physiology, to lend a hand. 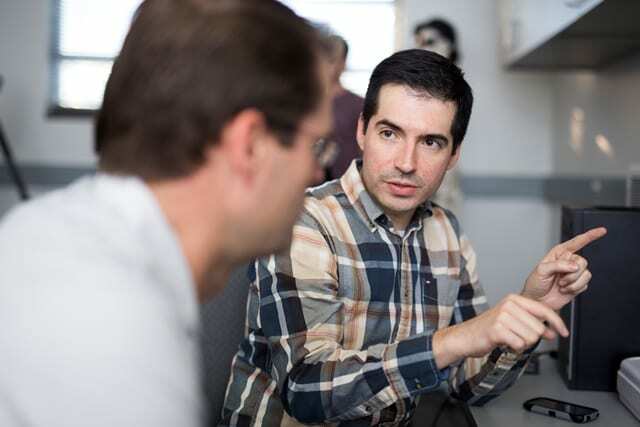 Together, Vejarano, assistant professor of Electrical Engineering, and Todd Shoepe, Ed.D., assistant professor of Health and Human Sciences, determined that fat beneath the skin can skew the accuracy of the sensors. The collaboration helped advance Vejarano’s work on wireless sensor networks and their application in the real world. “We wanted to know whether the user is performing certain movements correctly,” Vejarano says. But early tests showed that the sensors were less accurate when limbs were moved to more extreme positions, such as when the subject’s arm was fully extended. Shoepe pointed out that various tissues—bone, muscle, skin and fat—affect the position or alignment of the sensors. That knowledge made the difference. After running a number of tests, the two determined that accounting for the subject’s body fat in an algorithm to measure joint movement increased accuracy by up to 60 percent. Vejarano, Shoepe and a student coauthored an article reporting on these findings that was recently published in the IEEE Journal of Biomedical and Health Informatics. Vejarano and Shoepe continue to onboard new students as they expand the applications of their findings. The two are currently working with students to explore the use of wirele ss sensors to diagnose foot pronation and supination. Vejarano is also looking at ways to extend the life of the sensor batteries. “Oftentimes, casual conversation leads to collaboration,” Shoepe says. “You start talking and it just clicks. One thing led to another and we ended up with a really nice idea.” And that idea is seeding new ones.